This volume grew out of the annual Advertising and Consumer Psychology conference sponsored by the Society for Consumer Psychology. Representing a collection of research from academics in the fields of social psychology, advertising, and marketing, the chapters all focus on discussing existing and needed research to face the challenges of diversity in the next millennium. The contributors are researchers who have pushed the envelope in understanding diversity in advertising, rather than merely relying on theoretical frameworks developed decades ago when the demographics of the population were much different. This volume provides a vast array of information for academics and practitioners seeking to better understand how individual characteristics impact on the sending, receiving, and processing of communication efforts. 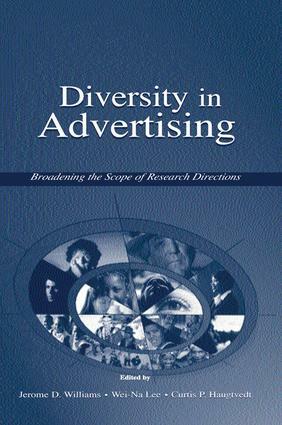 It highlights past and current knowledge on diversity in advertising, important questions that have not been addressed satisfactorily in this area, and how current theories can be used to construct better communication plans and message content. The various chapters draw upon existing literature from the fields of psychology, marketing, and related disciplines to amplify understanding and insight into developing effective advertising approaches to reach diverse audiences. This book will contribute to the understanding of the diversity of people, the changing landscape of the U.S., and the need for a more inclusive society. Contents: Preface. Part I: Historical Perspectives on Diversity and Advertising: Where We've Been and Where We're Going. W-N. Lee, J.D. Williams, C. La FerleDiversity in Advertising: A Summary and Research Agenda. L.T. Benjamin, Jr., Science for Sale: Psychology's Earliest Adventures in American Advertising. Part II: The Dark Side of Diversity in Advertising: Discrimination, Prejudice, and Bias. M.J. Sargent, On the Predictive Utility of the Implicit Association Test: Current Research and Future Directions. R.W. Livingston, Demystifying the Nonconscious: Unintentional Discrimination in Society and the Media. C. Wolsko, B. Park, C.M. Judd, B. Wittenbrink, Interethnic Ideology in Advertising: A Social Psychological Perspective. P.T. Vargas, D. Sekaquaptewa, W. von Hippel, It's Not Just What You Think, It's Also How You Think: Prejudice as Biased Information Processing. D.W. Schumann, The Transmission of Prejudice: What Do Our Marketing Strategies Really Reinforce? C.A. Cooper, When Perceptions Affect Broadcasting in the Public Interest: Advertising Media Buyers as an Economic Hurdle for Black-Oriented Radio Stations. Part III: The Influencing Role of Language in Diversity in Advertising. D. Luna, L.A. Peracchio, Language in Multicultural Advertising: Words and Cognitive Structure. W-N. Lee, C. La Ferle, M. Tharp, Ethnic Influences on Communication Patterns: Word of Mouth and Traditional and Non-Traditional Media Usage. R. Pennington, Discovering Brand Equity Through Psycho-Linguistic Methods. Part IV: The Influencing Role of Social and Information Contexts in Diversity in Advertising. S.A. Grier, A.M. Brumbaugh, Consumer Distinctiveness and Advertising Persuasion. J. de Heer, S.J.G. Bloem, S.E.W.M. Paijmans, Diversity in Advertising: The Influence of Contextual Conditioning Effects on Attitudes. Part V: The Influencing Role of Source Effects in Diversity in Advertising. J.S. Spira, T.E. Whittler, Style or Substance? Viewers' Reactions to Spokesperson's Race in Advertising. D. DelVecchio, R.C. Goodstein, Moving Beyond Race: The Role of Ethnic Identity in Evaluating Celebrity Endorsers. G.R. Henderson, J.D. Williams, Michael Jordan Who? The Impact of Other-Race Contact in Celebrity Endorser Recognition. Part VI: Broadening the Concept of Diversity: Going Beyond Black and White. G. Fennell, J. Saegert, Diversity: Population vs. Market. O. Appiah, It Must Be the Cues: Racial Differences in Adolescents' Responses to Culturally Embedded Ads. D.W. Schumann, J. Lee, K. Watchravesringkan, The Case for Separation of Asian American Ethnic Groups as We Consider Our Target Market Strategies. T.B. Greenlee, Mainstream Marketers Advertise to Gays and Lesbians: Strategic Issues and Research Agenda. G.K. Oakenfull, Targeting Consumer Segments Based on Sexual Orientation: Can Advertisers Swing Both Ways? P.A. Stout, J. Villegas, Health Promotion and Interactive Technology: Do Gender Differences Matter in Message Design? D. Fairfield, M. Johnson, The Presence of Religious Symbols and Value in Advertising. S.H. Ang, J.D. Williams, Ethics, Machiavellianism, and Social Values: Implications for Advertising.